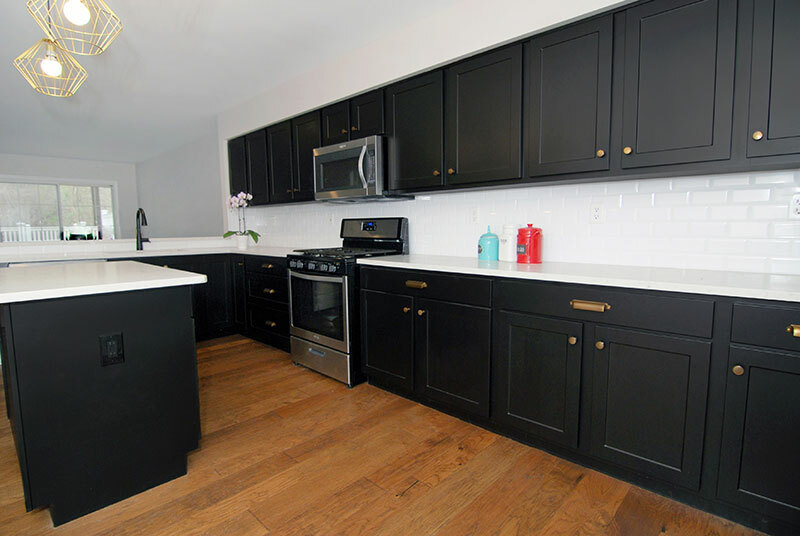 We can talk until we're blue in the face about how incredible cabinet refacing is for affordability (aka more $$ to spend elsewhere in your kitchen design), sustainability and so on. 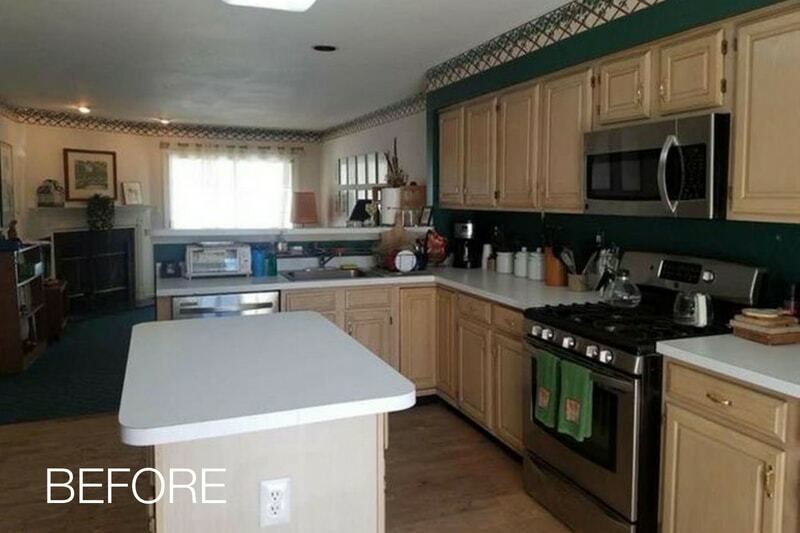 But a picture is worth at least 1000 words, so we'll skip ahead and show you some jaw-dropping examples of real Kitchen Magic pics where homeowners opted to reface—rather than replace—their cabinetry. The word "transformation" is often used superfluously—but not in these cases. 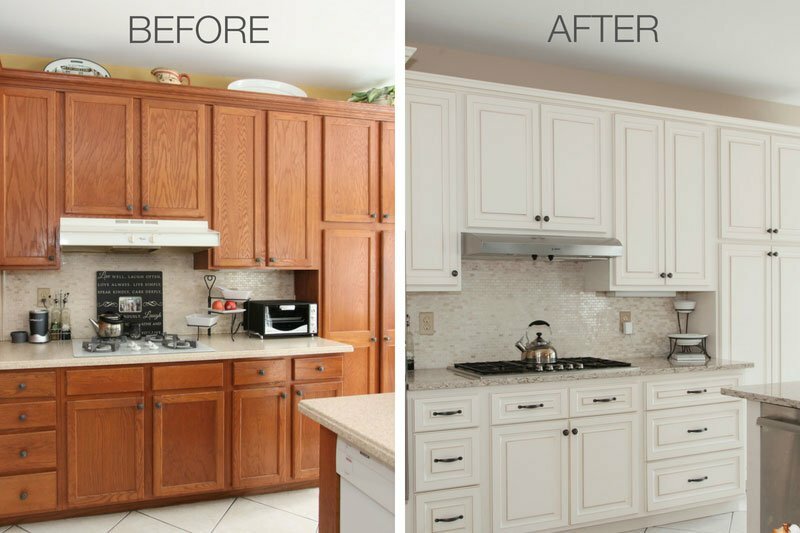 Just wait until you see these 8 cabinet refacing transformations that took outdated kitchens and made them worthy of a kitchen design magazine spread! Our first example shows how your favorite aspects of an outdated kitchen can be re-visioned with a little more style and finesse. 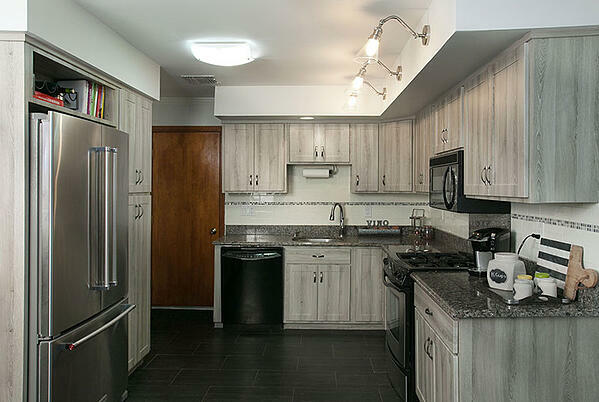 Originally, this kitchen was full of pattern and texture, but there was a dated quality to it, and it wasn't cohesive. 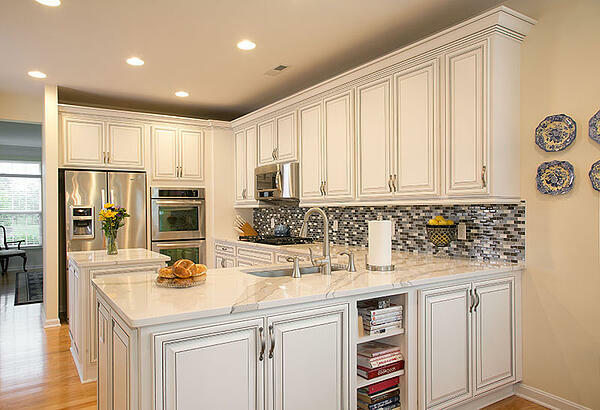 Once we refaced the cabinets with versatile Shaker-style doors, using glass inserts on the very tops, we found ways to integrate exciting patterns and metallic accents that are more unified and contemporary in their transitional design presentation. Look how just a few changes take a "not-quite-there" design and make it complete. 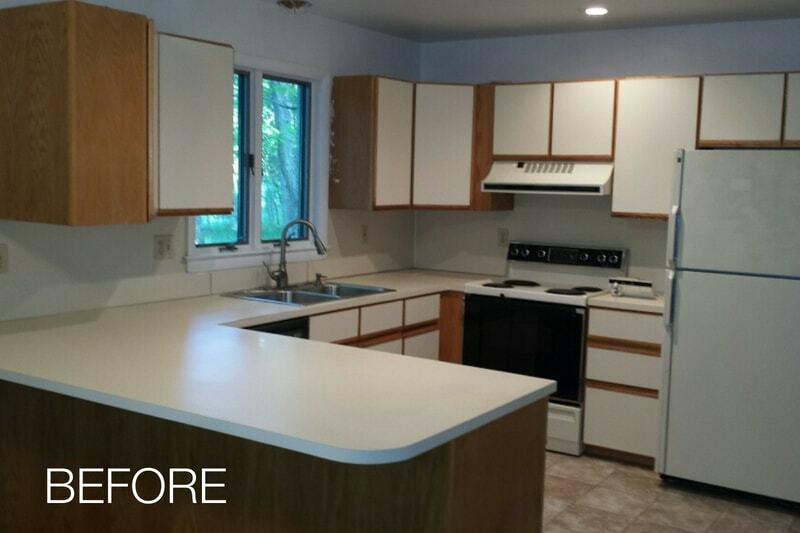 This kitchen had two issues—outdated oak cabinets and laminate countertops. 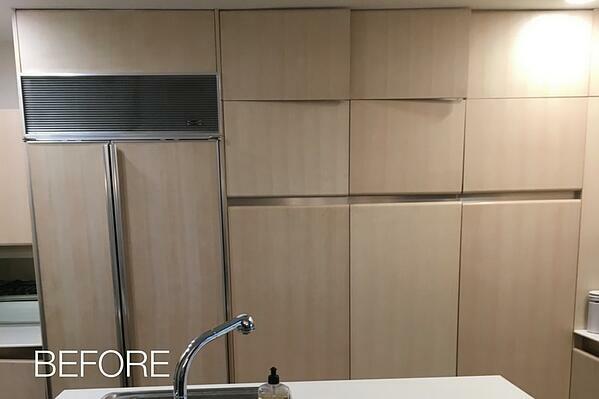 We refaced the cabinets with similar, raised-panel doors (tenets of traditional design), but with a streamlined woodgrain and a redder hue. 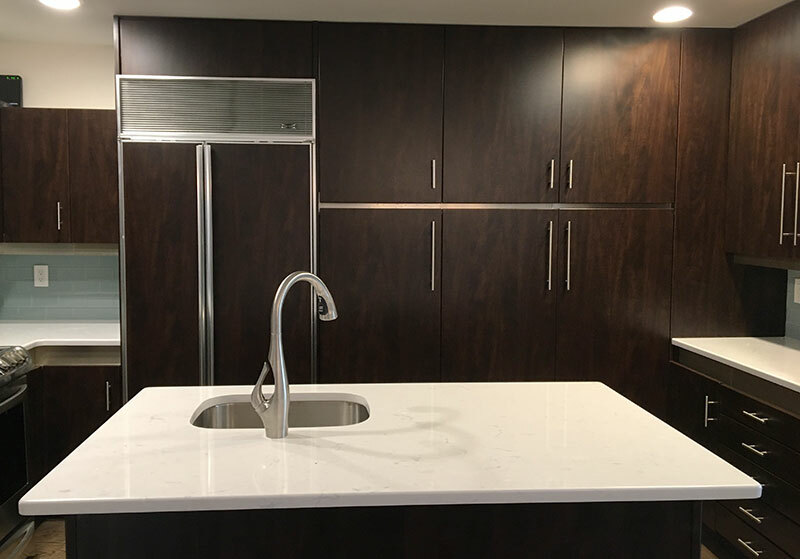 That, combined with new organizational features (notice how countertop clutter disappeared), a few stylish fixture and hardware swaps, and a gorgeous granite countertop, yielded exactly what homeowners were looking for. We're fans of wood-and-white combos, but this kitchen's expression of that screamed 1990s all the way. 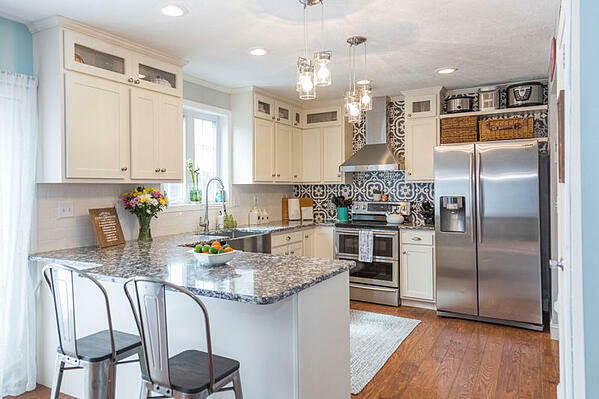 The owners were ready for something more contemporary, and they loved the idea of a gray kitchen palette. 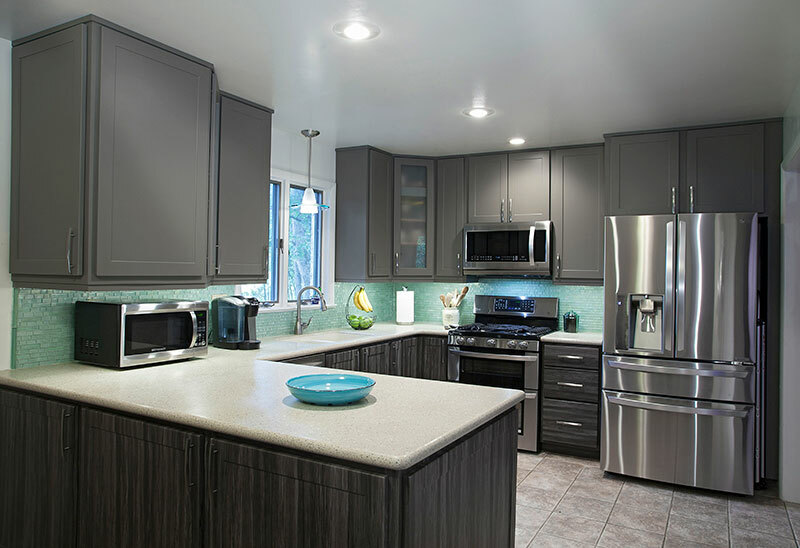 We installed two different cabinet finishes—patterned on the bottom and solid-color for the uppers, merged with a beautiful, aqua glass backsplash for a hint of luminescent color. New luxury appliances in stainless steel complete the look. This kitchen shows how a complete re-think of the cabinet style can send a blah kitchen design over the sophisticated top. The combination of white, vintage style doors—set off by a contrasting black glaze—and their gray-scale mosaic backsplash—create a stunning backdrop. Refacing also allowed more room to splurge on a luxury, marble-esque countertop that is actualy an indestructible Cambria quartz product. Cathedral-style doors are lovely, but all that busy-ness easily overtakes a space. That's exactly what happened in this kitchen that immediately heaved a cathartic sigh of relief when we simplified things via shaker-style doors. A finish reminiscent of aged barn wood adds pattern interest, and the new, simple backsplash with a line of decorative trim is visual icing on the cake. 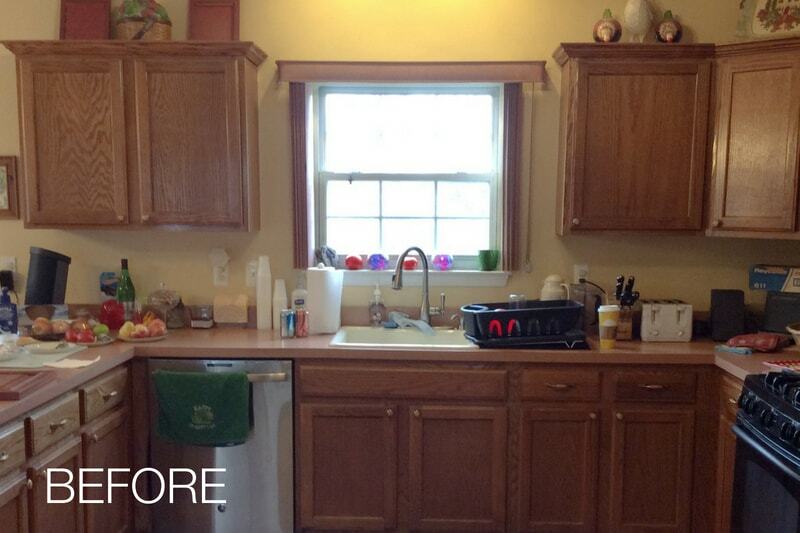 Pre-refacing, this kitchen had outdated oak cabinetry and no backsplash to speak of. The former needed an update; the latter made a boring transition from the adjacent dining space. Once we refaced the cabinets with beautiful, raised-panel doors in a rich cherry finish, and added a neutral backsplash, the traditional kitchen was immediately more elegant. 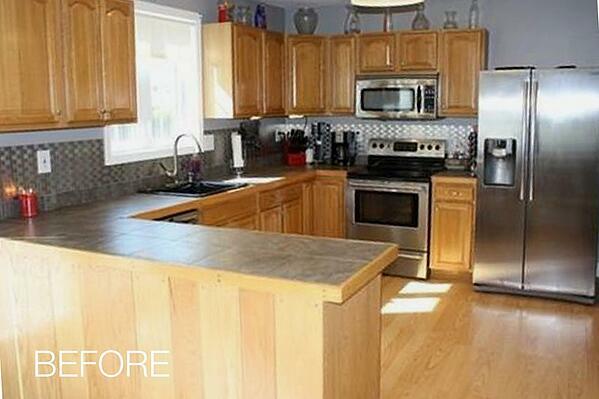 Refacing provides the opportunity for an instant style flip-flop. In this case, a very traditional-looking kitchen went instantly modern, using sleek, black cabinets tendered by warm brass hardware. Taking cabinets to the ceiling makes it all feel taller, and the new, geometric lighting fixtures become dazzling showpieces against the dark backdrop. 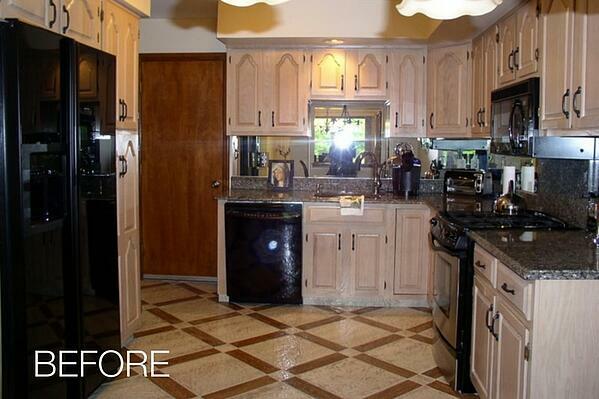 This kitchen shows how the change from dark-to-light is as powerful as going dark-to-light. 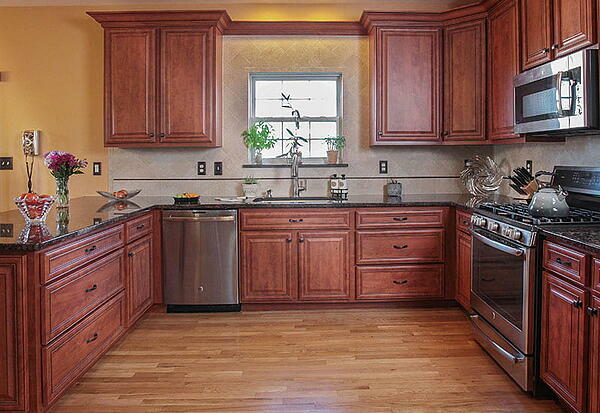 The existing maple-toned cabinets were not to the homeowner's taste, and they didn't like to stay closed, either. 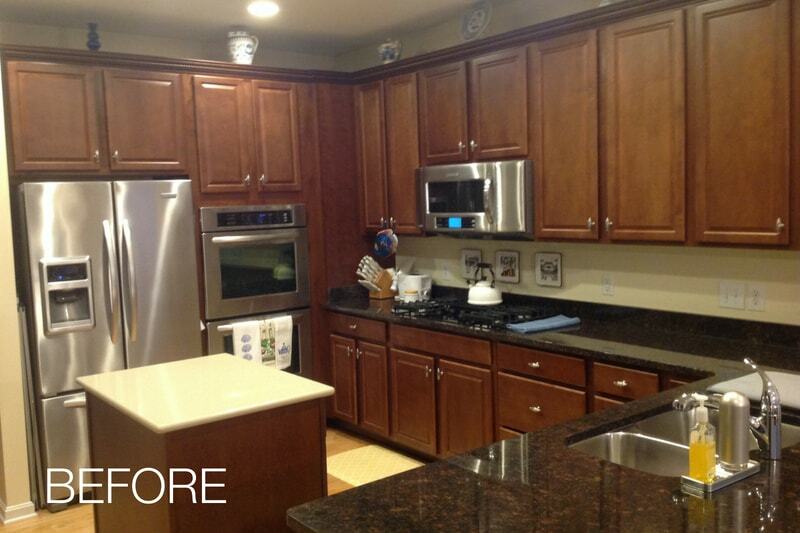 All we did here was reface the modern, flat-panel cabinets with a darker-finished counterpart. It immediately creates a richer atmosphere, and the lighter countertop pops for satisfying contrast. Notice how swapping out the top-mounted sink for an under-mount version makes the island seem larger? 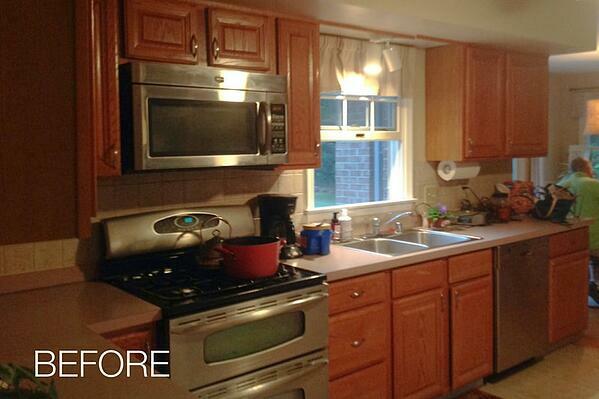 Ready to give your kitchen the refacing update of a lifetime? 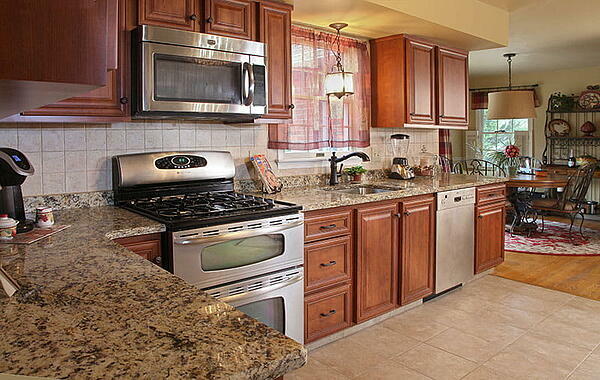 Contact us here at Kitchen Magic to schedule an FREE in-home appointment with one of our expert design consultants. We'll bring the showroom to you!